Homelessness is not acceptable. Not in 2018, and not in one of the richest countries in the world: the UK. 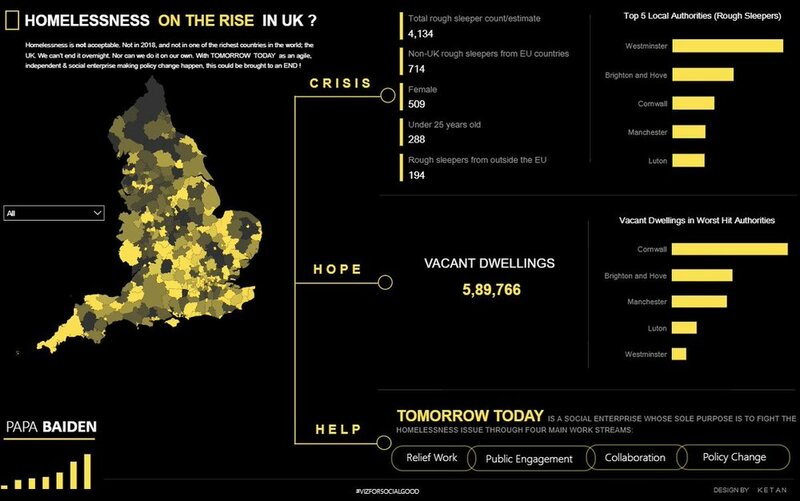 To raise public awareness of the issue and inspire people to engage with the solution, Viz for Social Good collaborated with Tomorrow Today, a nonprofit committed to ending homelessness, to produce a series of high-quality data visualizations of UK homelessness data and publish them online. More than 20 different visualizations were created by volunteers through the project, and the visualizations were viewed by more than 200K people globally. Our work has continued to be used to advocate for policy change.